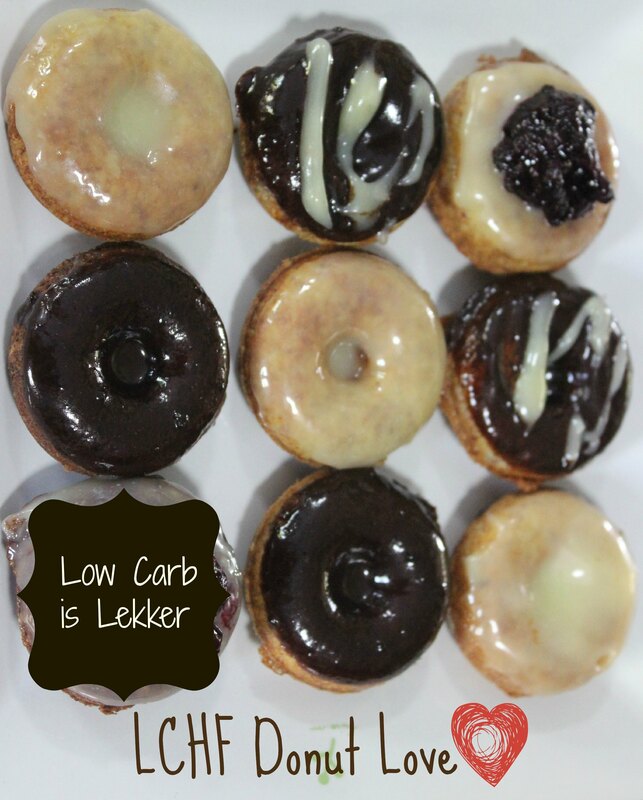 Low - carb is lekker. A Proudly South African Low carb, High fat, Survival Guide | Low – Carb, High Fat, Wheat free, Sugar free, Recipes, Tips and more! She is getting the hang of being really carb smart! I mean, you need to be one brave individual to take on the OATS TIGER! In short: If you are following a lower carb lifestyle and want to keep your blood sugar stable, oats might not be a wise staple at 66g carbs per 100g. Also, it is technically a gluten free grain but most oats are processed with and cross contaminated by other grains such as wheat, barley and rye, which I avoid all together. So to “decarb” this little recipe I really had to think of clever swop outs to keep carbs on the lower end and crunch on the very high end. Enter sliced almonds, gelatine and erythritol… e What? Eish… EE- Rye – thri – toll. A sugar alcohol and a natural sweetener. It’s finding it’s way into stores now. And off course you all know that gelatine is a super food when it comes to gut health. It also helps harden baked goods. Well I never!! Ok, let’s be real… we do not waste our precious ingredients on villains – we simply enjoy them, but you get the idea. If you only have xylitol to use as a sweetener, your cookie will be a bit more chewy and not as hard as with the erythritol. Now erythritol is a zero calorie, natural sweetener and is safe for dogs and other animals to consume,unlike xylitol. And because we have toddlers and a puppy in the house, I have switched to erythritol until I can teach the girls not to feed Sherman our Bully, their cookies. You can buy erythritol from Dischem or other health stores. Like I said, don’t panic if you only have xylitol at your immediate disposal, simply dry your crunchies a bit in a low temperature oven, like you would do with rusks. My older kids love the chewy version too. Preheat the oven to 180C and line a rectangular brownie pan or pyrax pan with baking paper. Mix the gelatine and water in a small bowl and allow to bloom. Mix all the rest of the dry ingredients together. Remove the butter mix from the heat and gently stir in the gelatine mix. It might bubble a bit at first. Bake for 20 – 25 minutes until golden brown. Allow to cool for a minute or two and then lift out and cut into 40 blocks. The cookies will harden upon cooling. Store in an airtight container. Yields 40 squares @ just over 1g carbs each. From my kitchen to yours…Enjoy! 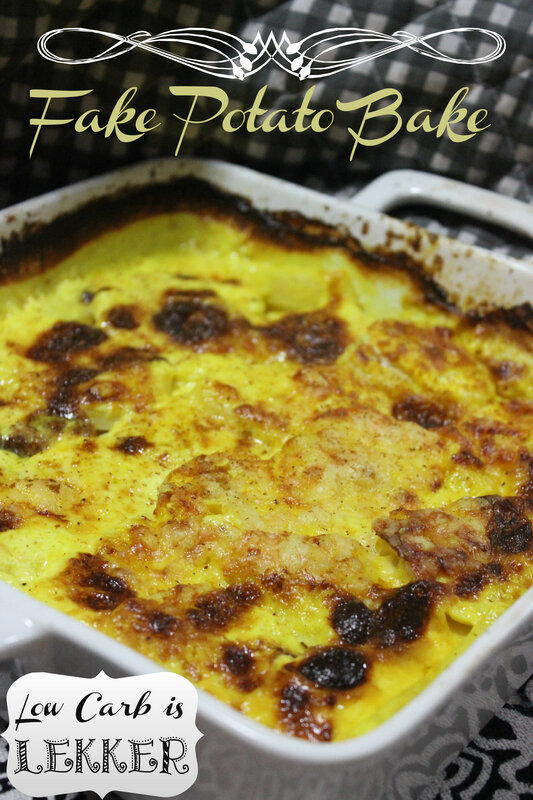 Turnip Bake – NoTato Bake or Fake Potato Bake – Whatever floats your boat! 1. 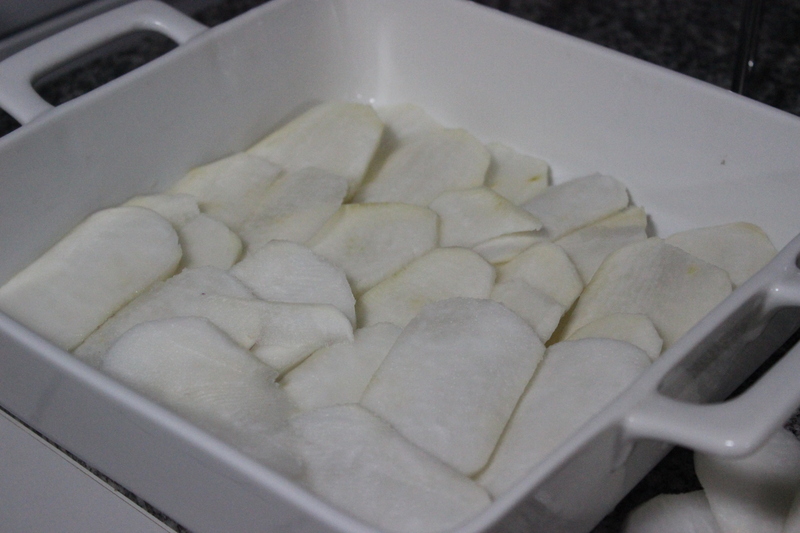 Peel and thinly slice your turnips and put a layer into an oven-proof dish. 2. Pour half the cream over the turnips. 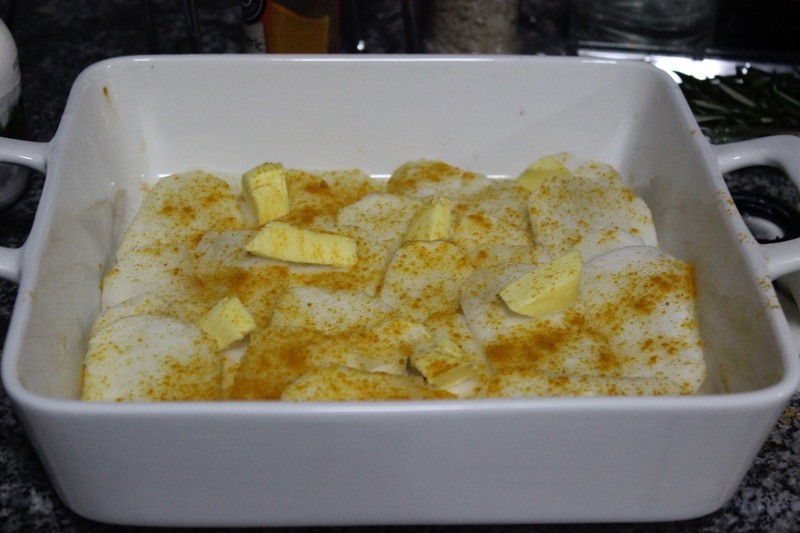 Sprinkle 1 tsp turmeric over the first layer and use one Tbsp chunks of butter on the layer. Sprinkle with half the cheese. 3. Repeat another layer as above. 4. Bake for 35 – 40 minutes at a 180 degrees. 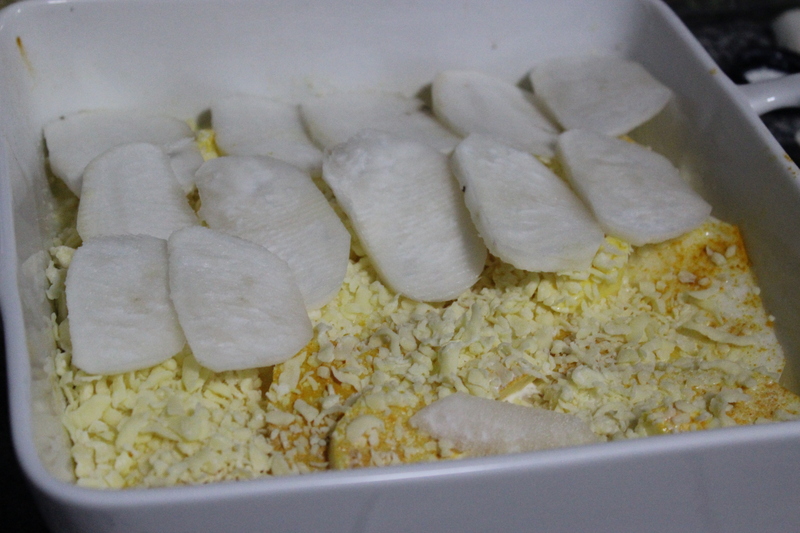 I served this comforting side-dish with some grilled chicken. 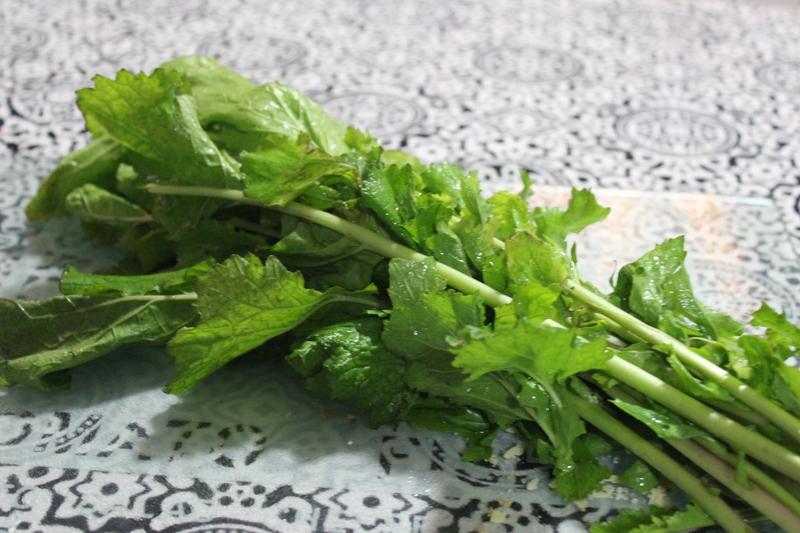 Now if you really want to be resourceful and take your turnip-experience to the next level, pick a bunch with beautiful turnip greens. These greens are filled with cancer-fighting properties. 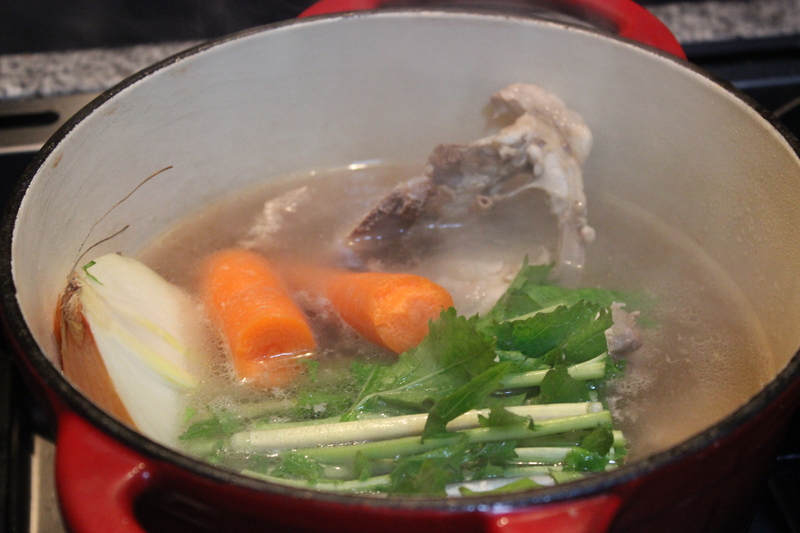 I used mine to make a broth along with the chicken bones from the carcass after I cut my chicken into pieces. Simply add 1 carrot, half an onion, turnip greens, 2 free-range wings, chicken bones, garlic, salt, peppercorns and apple cider vinegar to create this nutrient-dense broth. I used the broth the next day, simply added some mushrooms and cream for a lovely mushroom soup. We had this ad a few years ago where someone mistakenly thought coffee names like espresso and mochachino where actually a foreign language. The punchline for the ad was ” I love it when you speak “foreign” to me! When I named this creation I thought it was so funny that this name sounded so foreign while this soup is actually so plain and simple. I made this soup for all the teachers at my daughter’s school today and got many recipe requests even from non-low carbies. Just goes to show you can’t judge a soup by its colour. In a large saucepan on medium-high heat boil your pumpkin chunks in water until soft. (Don’t strain the excess water from the pot.) Allow the pumpkin to cool for a bit. On a low carb diet, healthy fats are like fuel. Superior fuel really! It is like the exclusive jet fuel that propels and allow you to excel, really! Boosting metabolism, establishing stable energy levels and bringing a clarity to the brain. In my experience, I have seen people having a hard time to “file” fat intake on a LCHF lifestyle properly. I constantly see people eating more protein, less carbs and a bit of fat. It is hard to fathom the role fat needs to play when all we have ever been told is to cut it off, skim it off or throw it away. 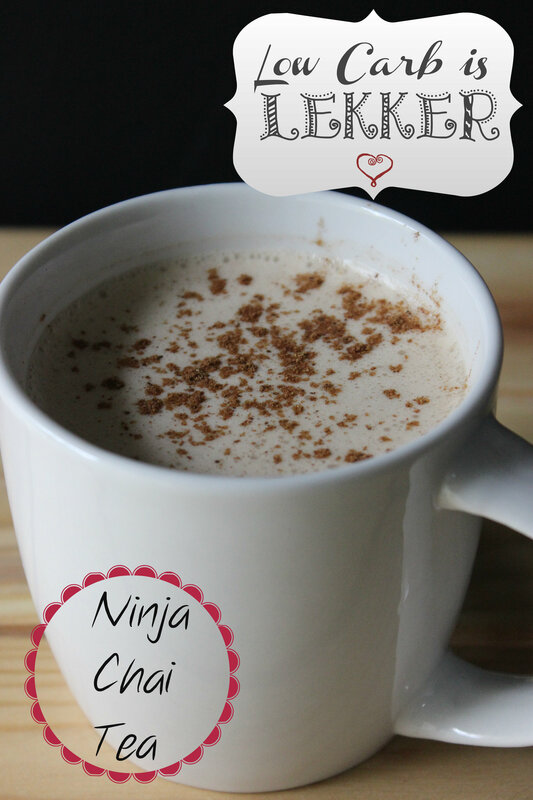 Let me tell you, I currently sleep around 3 – 4 hours a night and nurse twins, this drink is a great pick – me – up that also helps me to cope better mentally and physically. And yes, I selfishly designed it around my needs and current coffee limitations. Also, we had the sniffles entering our household a week or so ago, so it made sense to combine the germ fighting immune boosting properties of ginger and cinnamon along with the anti – inflammatory properties of coconut oil and the anti – oxidant boost of the rooibos tea. So like our friend Winnie the Pooh always says: “Sharing is caring” and I care about you, my fellow low carbie. So let me share this little gem with you. In a saucepan on high heat, combine the water teabags and spices. Allow to boil for a few minutes before removing from the heat to steep for 5 minutes. 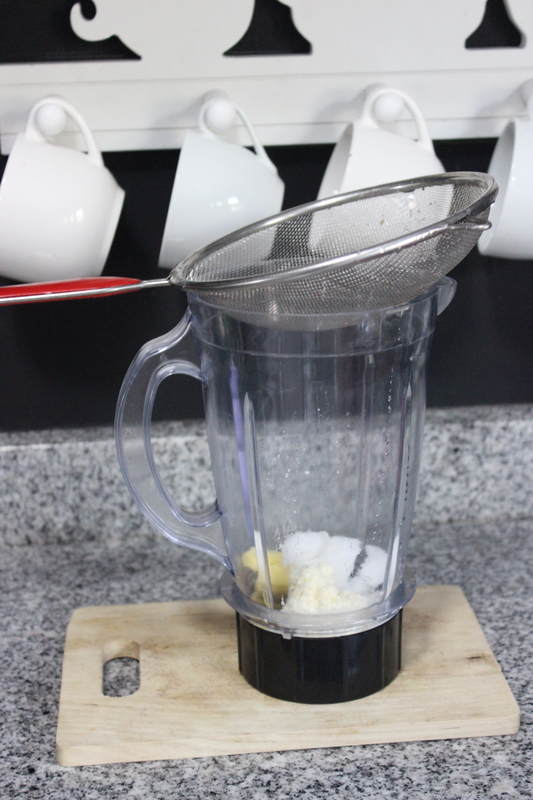 Add all three fats to a blender. 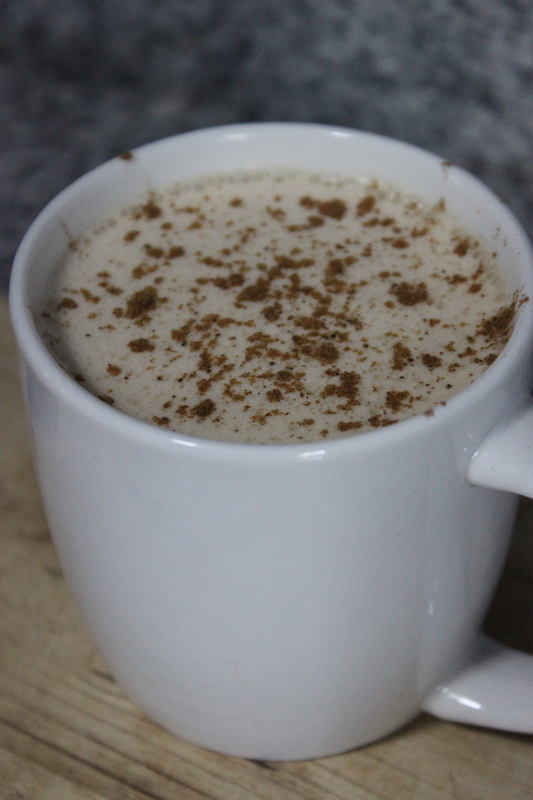 Use a sieve to strain the spiced tea mix into the blender. 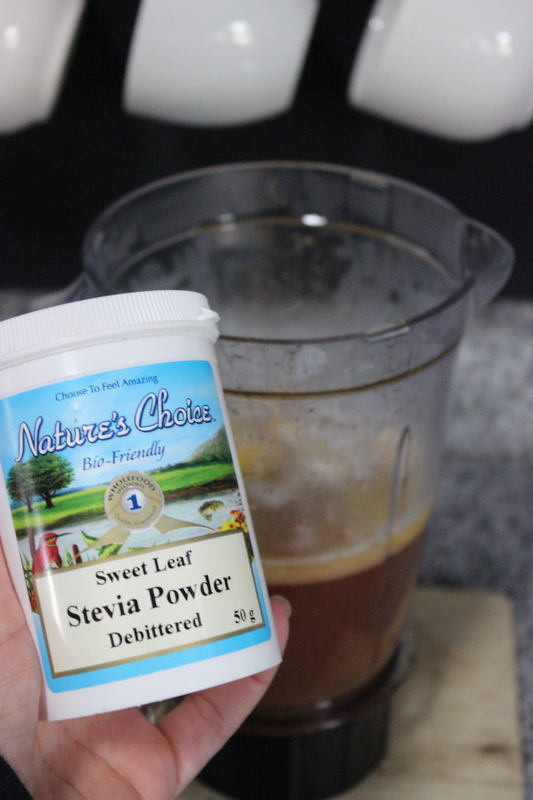 Add a knife point of debittered stevia if you would prefer a bit sweeter tea. 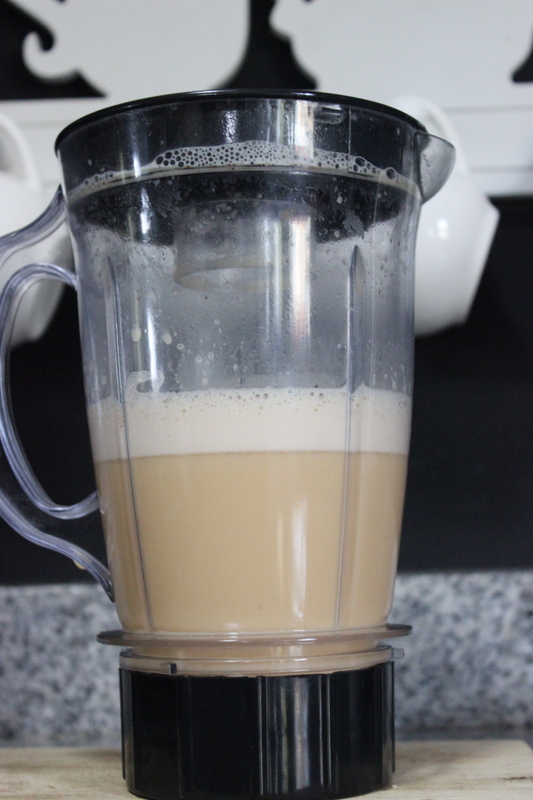 Blend for a minute or until all the fats have emulsified and you see a creamy, frothy, rich consistency. Sprinkle with a bit of mixed spice or ground cinnamon. Yields 2 servings at about 1 gram of carbs per cup. Go forth, and share your Ninja powers with the world, and remember to smile and be awesome ok! A low carb lifestyle to me is all about swapping food that’s filled with empty nutrients with nutrient dense produce. It really amazes me that people can build so much of a meal around carbs. The word lasagna was derived from the Roman word that means “Cooking pot”. However, if you would type in the word lasagna you will get the description of a dish made with pasta strips. We are going to make a mighty fine lasagna dish today without pasta or flour filled sauces. We are simply going to keep things REAL. Real yummy and nutritious that is. In a large oven proof dish, allow the coconut oil or lard in the oven proof to melt and then pack a first layer of brinjals to cover the bottom layer of the dish. 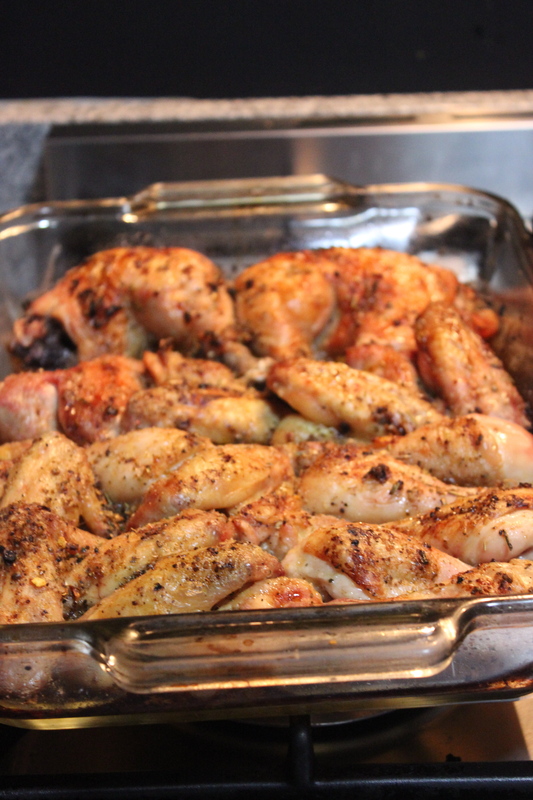 Pop into the oven for about 15 minutes till tender. In the meanwhile, brown your mince and then add the BBQ spice, salt and pepper, herbs, tomato puree, xylitol, garlic and 1/4 cup water. In a separate pot, boil/steam the spinach and a pinch of salt in a small amount of water. As soon as the spinach is just a little more cooked than the wilted stage, drain the excess water, add the cream and cream cheese and allow the cream mix to thicken and reduce for 5 + minutes while stirring gently. In a separate bowl whisk your eggs into the milk. 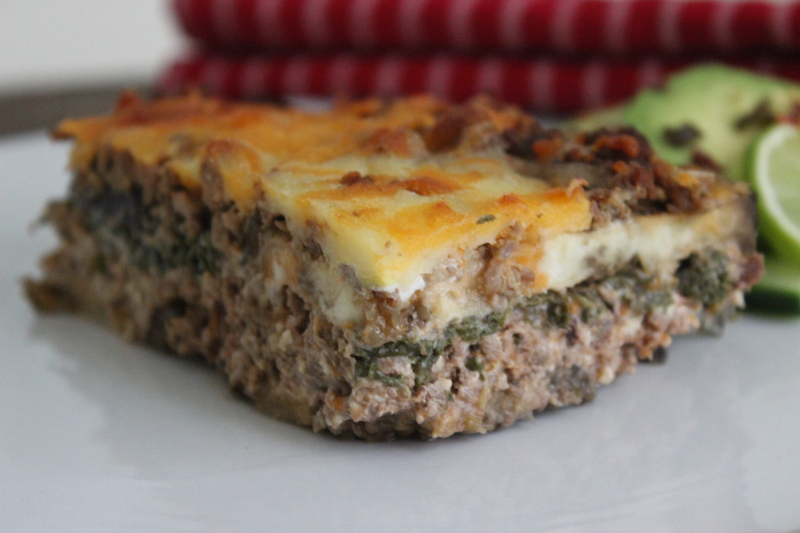 Now use halve the mince and layer on top of the brinjal layer, followed by the creamy spinach. Then pack the rest of the raw brinjals on top of the spinach cream followed by another layer of mince meat. 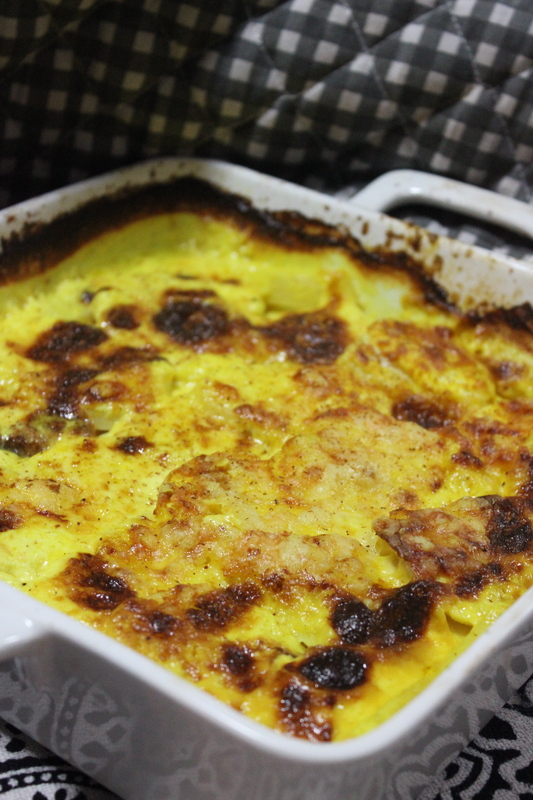 Sprinkle the cheese over the meat and pour the egg mix evenly over the entire dish. 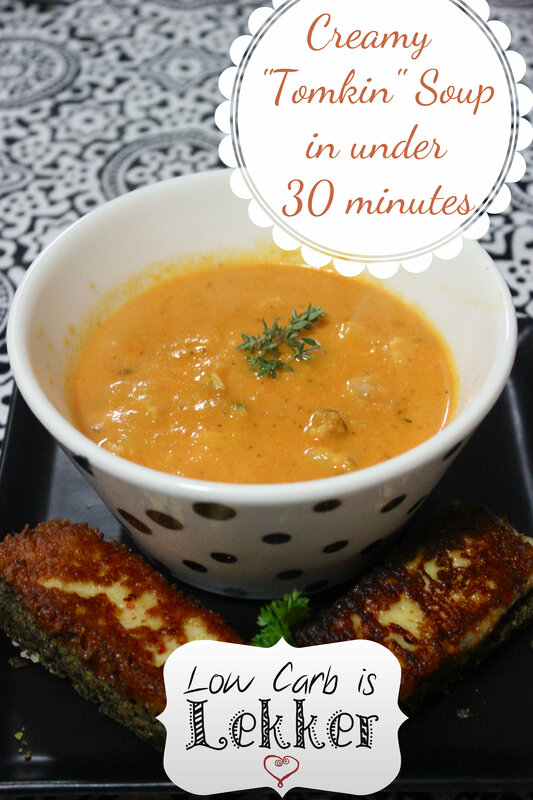 Bake for 20 – 30 minutes and Koos is your cousin! Okay or Bob can be your uncle if you insist. Serve with a beautiful green salad and be sure to save some for the next day’s lunchbox. It is divine eaten cold too. YIELDS ABOUT 8 – 10 PORTIONS AT ABOUT 8 GRAMS OF CARBS EACH. 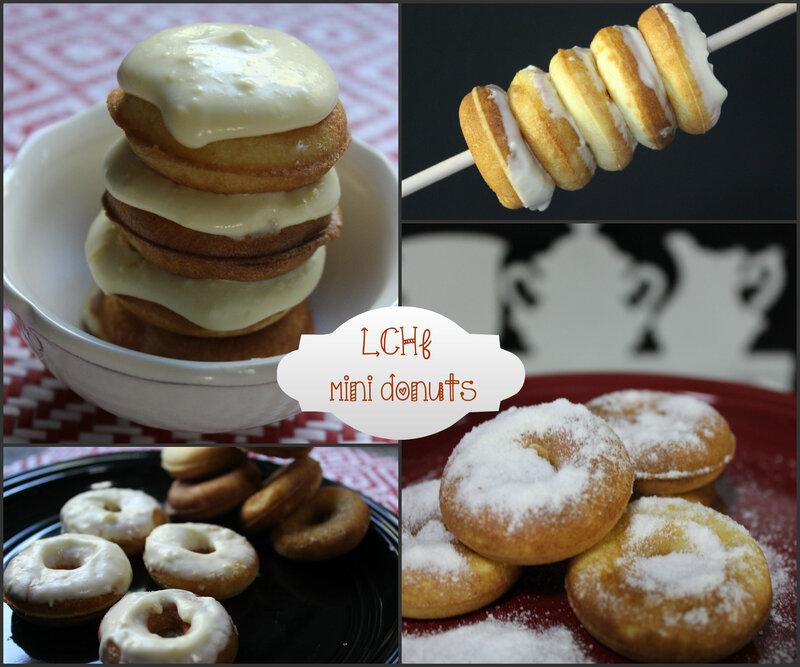 When I started experimenting in my mini donut maker, I really wanted to capture that almost gluten like texture. I found that adding cream cheese to the finest possible nut flour ( I used macadamia but almond will be just as good.) did the trick. Also then, achieving the fried oily outer crust of that donut or “oil ball” as we call it in Afrikaans, is possible by adding 1/4 teaspoon of coconut oil to each donut mould. Got all round thumbs up and so I’m happy to share my version of a basic donut recipe. This batter can be used for donuts, flapjacks or waffles! I know … and yes, you are welcome! With a blending stick, mix the cream cheese, vanilla, xylitol and eggs together to a thin custardy consistency. Add the nut flour and baking powder and stir into the egg mix. Immediately dip into or coat with your preferred topping and eat while hot for the best little fiesta in your mouth. Simply grind 2 Tbsp of xylitol and add some ground cinnamon to taste, mix and sprinkle over your donuts. In a saucepan on medium high heat, allow the ingredients to boil and reduce for about 3 – 5 minutes while constantly whisking. You don’t want it to be too thick or “fudgy” though. Dip your mini’s into the sauce and enjoy. In a saucepan on medium – high heat, allow the ingredients to boil and reduce for about 3 – 5 minutes while constantly whisking. You want it to be too thick and glossy. Just be careful not to burn this sauce, rather reduce heat and simmer longer if you feel unsure. 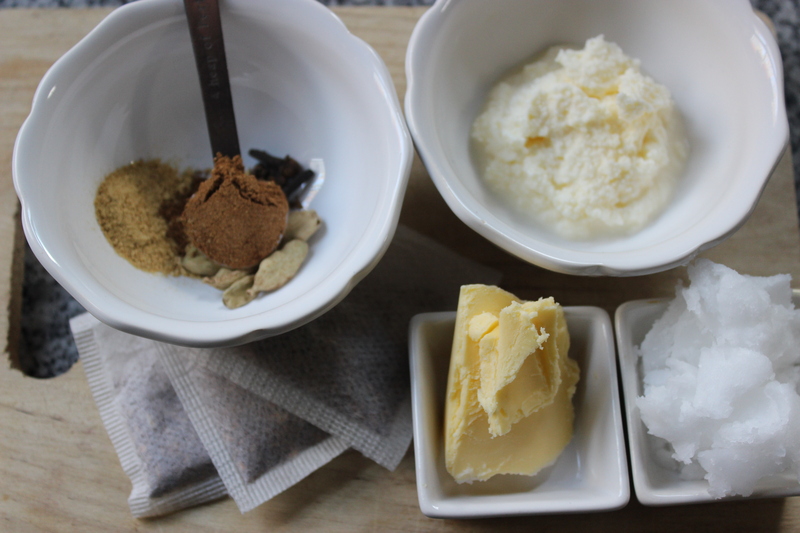 Use 1 part cream cheese, 1 part soft butter, 2 parts milk/cream, powdered xylitol to taste and vanilla. Mix till smooth and scoop onto your donuts. You can even squirt in some lemon juice and add some lemon rind. These are some basic ideas to get you going. Aren’t you glad you can eat more than the hole in the donut again? Next post we are taking this donut concept out of the box… so excited to share. 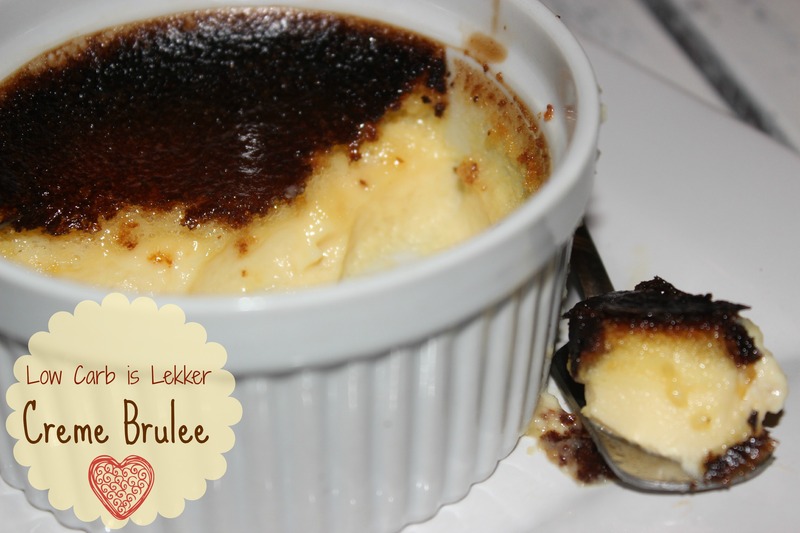 Creme Brulee – Now that’s amore! I’m sure there must be an international creme brulee day! This comforting dessert has made it’s way onto many a fancy schmancy menu and rightly so. The creamy decadence allows you to feel like your proverbial ship must have come in and you are playing with the rich and famous right? 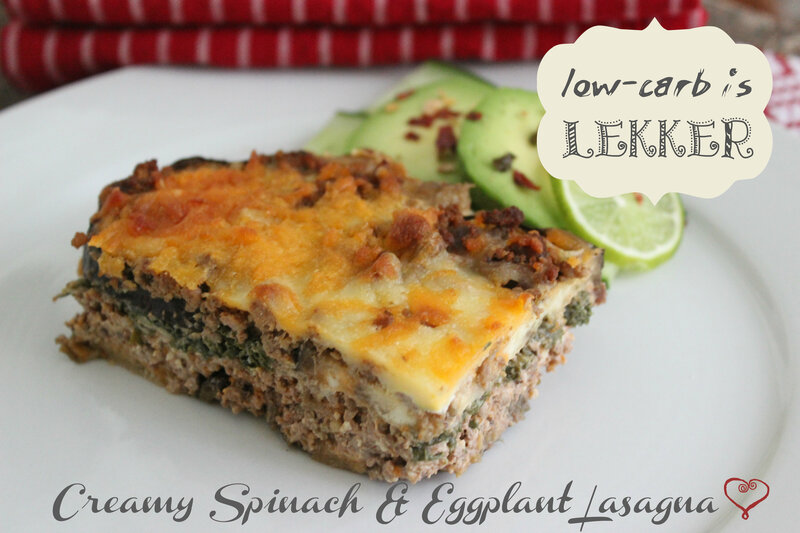 Well here’s the thing… it’s actually really easy to whip up this beauty and this is in fact a perfect low carb high fat special treat for every once in a blue moon. NOW I HAVE ONE DISCLOSURE HERE: This recipe does not make the hard cap that regular sugar would achieve. Xylitol cannot harden like sugar, BUT the taste is a perfect marriage between creamy smooth custard and a slightly burnt sweet topping. Pour the cream into a saucepan. Add the vanilla into the cream. Bring the cream to boiling point, then reduce the heat and simmer gently for five minutes. Meanwhile, in a separate bowl, beat the 2 Tbsp xylitol and egg yolks together in a large heatproof bowl until a light colour and fluffy texture is achieved. Bring the cream back to boiling point. 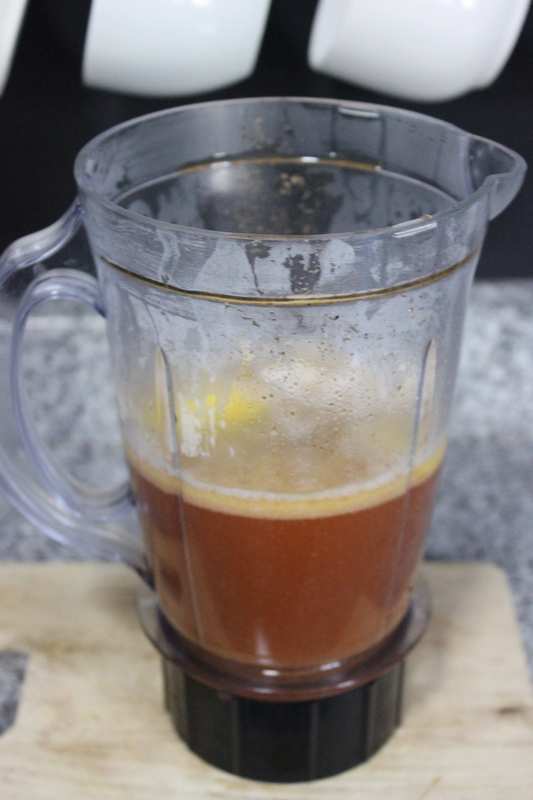 Pour it over the egg mixture, whisking continuously until thickened somewhat. Fill six ramekins to about two-thirds full. Place onto the centre shelf of the oven and bake for 40-45 minutes, or until the custards are just set but still a bit wobbly in the middle. When ready to serve, sprinkle one heaped teaspoon of xylitol (or a bit more…) evenly over the surface of each crème brûlée, then caramelize under the grill for a few minutes or use a chefs’ blow-torch . Yields 6 portions at 4grams carbs each.